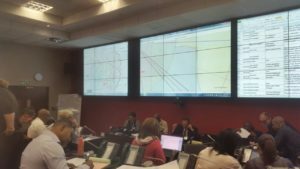 HAMNET was invited to participate by the Disaster Risk Management of the City of Cape Town with their annual Koeberg Nuclear Disaster Exercise. 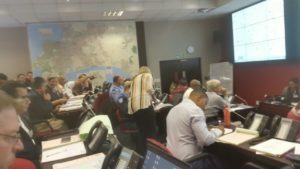 This was the first time we participated with this particular exercise and the second time we’ve participated with the City of Cape Town’s Disaster Risk Management exercises. We had seven volunteers who participated, consisting of David zs1dav, Dean zs1kp, Hendrik zs1eee, Philip zs1pvv, Rob zs1sa, Stephen zs1bsw, and Alister zs1ok. Joint Operations Centre – Dean as a former mechanical engineer at Koeberg sat with the rest of the members in the JOC and from here all the aspects of the exercise was managed. HAMNET Communications Room. Rob zs1sa and Stephen zs1bsw were behind the controls relaying messages as and when required, using the VHF/UHF and HF equipment. Command Bus – David zs1dav represented HAMNET at the Command Bus, which at one stage departed at high speed to a new location quite some distance from where they were due them being put at “risk” by the a change in wind direction which carries “radiation” with it. Dave’s multi-faceted ability came to the rescue of some of the very hungry participants when he was able to open their tuna cans, which was part of the day’s ration packs, with his Leatherman. Figure 3 One of the two locations where the Command Bus was parked, together with various role players also taking part in the exercise. 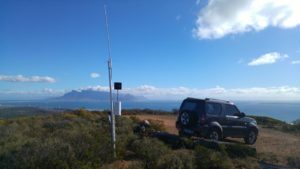 Hendrik zs1eee and Philip zs1pvv were stationed at the Koeberg Volunteer Centre from where they operated on both VHF/UHF and HF. Alister zs1ok was a part-time roving participant during the event. One of the advantages of living in Cape Town was setting up a cross-band repeater on Blouberg Hill . In general the exercise and the HAMNET participation went off well. Everyone learnt a great deal in various ways, and since this was the first exercise of this nature with the City of Cape Town’s Disaster Risk Management there are several areas where we could definitely improve on. We would love to get more HAMNET operators to participate, despite the exercise being run during normal working hours. We need to make use more of digital technologies, in particular systems that can be used to send text to other operators or participants. This requirement is particularly relevant for information or formal communications issued from the JOC and the HAMNET Comms Room. Using text based system is the best way to keep operators well informed without interrupting them with their parallel activities. An operator can re-read a text message rather than having to request a voice message to be resent for clarification. Specific terminology can be used in a text based message which would be more difficult to convey in a standard voice message. The other major advantage of a text based system is that it automatically provides a log of all messages, communication and whatever else needs to be recorded. In prior discussions with ESCOM they expressed specific interest in HAMNET’s ability to offer backup communications because of their ability to transfer text messages and files (using digital modes, e.g. fldigi) as well as sending of emails (e.g. using Winlink) via radio. The ability to provide nomadic HF comms rather than mobile HF comms. We generally do not require HF comms to be used while driving a vehicle. In this context an HF station requires the ability to up and leave to a new location within minutes. The operator should therefore ideally operate from their vehicle or a go-box and all that is required is to pack away their HF antenna. The operator must be able to set up to use 80m and 60m comms with the current propagation conditions. During winter months being able to use 160m would also be required. 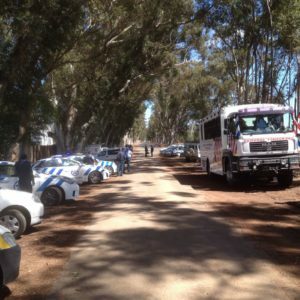 HF comms is important to test and maintain since there is a requirement with certain of the Koeberg exercises for the Koeberg region to be “vacated” and for the command teams to relocate to rural areas such as Citrusdal, Mooreesburg or even Ceres to get away from “nuclear fall-out and contamination”. During such events it is vital to maintain comms via HF due to these areas not necessarily being served via VHF/UHF repeaters. During a real Koeberg incident HAMNET would be required to assist for several days. It is therefore important having sufficient HAMNET volunteers to permit operations to run over multiple days using 12 hour shifts. Meticulous notes were maintained by Dean during the development of the exercise. It was felt that using an electronic version of this which could automatically share vital information with all the HAMNET role players and would be of much more value than only using voice communications. This concept was reinforced by the fact that it is impractical to use radio communication (handheld radio) in a controlled environment such as the JOC, and the audio from the radio caused disruptions. Even using a headset with the radio was said to be impractical in this setup. At least two operators are required for the Control room as there is just too much happening in parallel for one operator to manage appropriately. Since it was the first time that both Rob zs1sa and Stephen zs1bsw operated from the HAMNET communications room they were not very familiar with the facility’s equipment despite them being skilled amateur radio operators. During an emergency it is vital for operators know their equipment well and are able to optimally use the equipment. It is not a static operating environment and there are ongoing changes required on the equipment. Despite having sound dampening facilities, which is ideal for a very active comms control centre, the one drawback of the facility is that it is isolated from where real the rubber hits the road. As a result they have insufficient information about the development exercise. Having the text based system mentioned above would also greatly assist. It was the second time David zs1dav has been with the Command Bus and fortunately the staff operating from the bus were well informed of his presence and his role. Since the bus may be redeployed to more suitable or different locations at any time it is vital for this HAMNET operator to be set up and proficient at using mobile comms. Even their HF equipment needs to be setup such that they can redeploy at short notice – and merely recover their long wire antenna deployed from their vehicle. Hendrik zs1eee and Philip zs1pvv are quite adept at setting up a station in a new location. This was their first involvement at this facility and as we also intended testing HF communications, the HF antenna had to be set up in a manner that the environment remained safe for other staff participating in the event. We did not want people to get RF burns from the antennas. One of the drawbacks of using a cross-band repeater is that it does not provide any feedback (i.e. a whiplash) when pressing your PTT. Thus an operator using a cross-band repeater needs to have two radios – each one tuned to one of the frequencies of the cross-band repeater. When transmitting on the one radio you should hear yourself on the other radio. All the personnel at the Volunteer Centre were required to relocate to a new location necessitating moving the radio station elsewhere. Thus this nomadic requirement makes the ability to have a go-box very practical. Basically unplug your power (if you are only using mains), pack away your antenna, and load your equipment in the vehicle and move to the next location. Alister zs1ok was mobile during part of the exercise, and being mobile leaves an operator with a limited ability to effectively participate with communications while driving. You need a second person to assist – either as driver or as communicator. Particularly once you start using digital comms (text or graphics) it would be safer and better to have one to assist you. Once again thank you to everyone on the team who made this event a learning event and an enjoyable one!! This entry was posted in Exercise, Western Cape by Dave Reece. Bookmark the permalink.